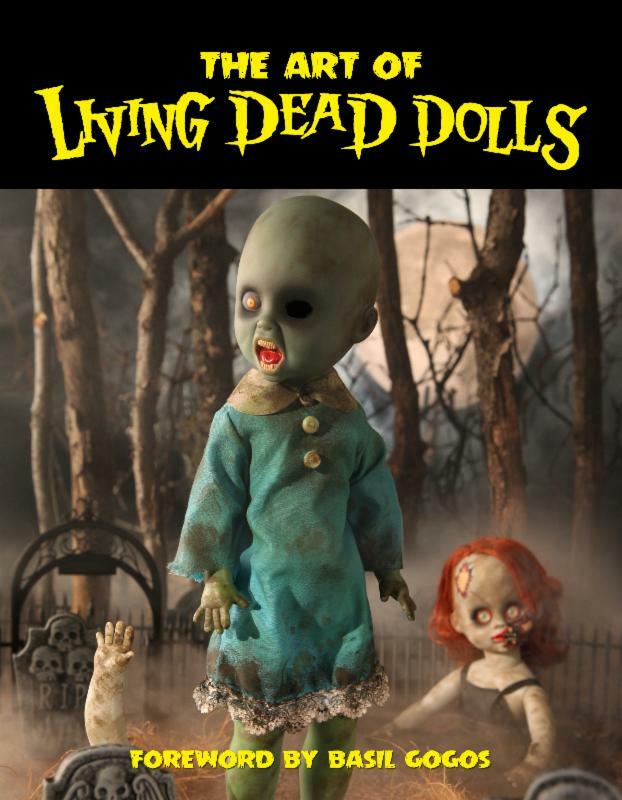 As noted in previous features, 2014 marks the Sweet Sixteenth year Mezco Toyz’ Living Dead Dolls have graced the planet. The continuing collection of creepy creations was conceived by Ed Long, Damian Glonek, and Mez Markowitz, who have thus far unleashed 28 multiple doll series encompassing every hobgoblin imaginable. The company has conjured up several interesting ways to pay tribute to the monstrous muñecas this year, including a “time capsule coffin” event, and the LDD party continues with the publication of The Art of Living Dead Dolls. Over the years Mezco’s putrid progeny have found a home in the hearts of many talented artists and the new book showcases their LDD inspired works. An impressive list of over 100 artists share their unique views of the LDD universe across the book’s 80 pages. The wide array of styles and varied media (oils, gouache and acrylics, to pen and ink, screen print, and digital) produce a visually arresting experience for the reader. There’s plenty here to peruse and enjoy. I’m currently enamored with Louis Russomanno’s graveyard as schoolyard scene, Emily Yoshizawa’s LDD populated doll house, Becky Bray’s “Rain,” and Chris Garafalo’s Calavera print. 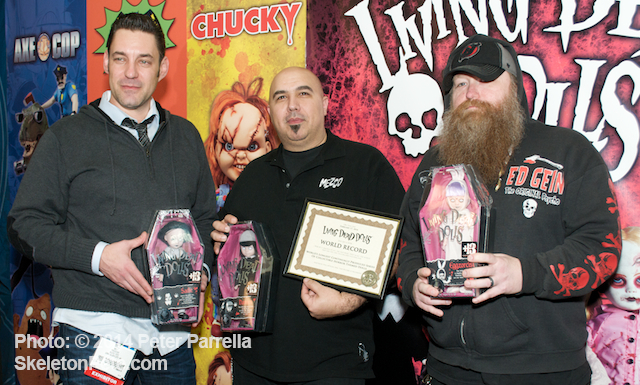 Mezco’s Mez, Damian and Ed received Living Dead Doll World Record Award at NY Toy Fair 2014. Also featured are photos from the Mezco’s 2006 Living Dead Dolls Art Show, in which participants transformed the dolls into their own hellish visions. There are lots of striking manipulations (mutilations?) including Damien, Mez and Ed’s own iconoclastic dioramas, but it was Randy Falk’s King Diamond LDD remake that made me laugh out loud. The softbound first edition has an embossed cover which adds a nice touch of depth to Joshua Hoffine’s backwoods at witching hour tableau. The interior color is vibrant and saturated and art reproduction is ace. The book’s foreword is fittingly offered by artist Basil Gogos whose cover paintings for the original Famous Monsters of Filmland magazines virtually invented the modern monster art field. Living Dead Dolls Series 28, all dressed up and ready to party. In my experience fans are always in the forefront of Mezco’s doings and they aren’t left out here. Rounding out the book is a full section of art from fans of all ages, as well as a tattoo chapter chronicling the body art of those who have dedicated a stretch of their own flesh to the Living Dead Doll phenomenon. Mezco will further furnish fans with an exceptional opportunity built around the 2014 NYCC Superweek. On October 10th @ 8PM they will invade their favorite haunt, Ripley’s Believe It Or Not Odditorium, for a signing by the LDD team and select artists represented in the book. Mezco says, “One of the Ripley’s Believe It Or Not Times Square Odditorium rooms will be sealed off and transformed into a haven for Living Dead Dolls fans. On display will be an assortment of rare and one of a kind Living Dead Dolls artifacts direct from the Mezco archives. Many of these items have never been seen by the public, and a select number of them will be available for purchase, including hand painted prototypes, and concept art. The first 200 attendees will each receive a free Living Dead Doll themed goodie bag plus a chance to win a test shot set of Living Dead Dolls Series 28 dolls. Test shot sets are seldom released to the public, making this a rare chance for a fan to acquire one of the most sought after collectibles in the Living Dead Dolls universe. You’ll have to show the secret sign of three Ripley’s Collector Coins for free entry – be sure to check out the details at the Ripley’s website.